In McBride v. Infinity Prop. & Cas. Corp., Case No. 3:13-CV-1737 (M.D. Pa. March 24, 2014 Conaboy, J. 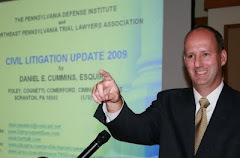 ), Judge Richard P. Conaboy of the U.S. District Court for the Middle District of Pennsylvania addressed an insurer’s subpoenas to third parties in a breach of contract/bad faith claim arising out of the carrier's refusal to pay first party medical benefits to the plaintiff for personal injuries allegedly sustained from an auto accident. The carrier had refused to pay first party medical benefits on the basis that the insured allegedly misrepresented his state of domicile at the time he made his application for insurance by that stating that his residence was in Bushkill, Pennsylvania rather than New York. The carrier stated that this was a material misrepresentation on the application that, therefore, no coverage was due. It was the insured's contention that he moved to Pennsylvania in 2012. The discovery issue presented in this case centered around the scope of discovery on the pertinent issue of residency. Overall, the court limited the carrier's discovery efforts to the years 2012 and forward for such items as the insured's tax returns, voter identification records, credit card statements, bank statements, records pertaining to the insured's receipt of governmental benefits, documents related to the insured's driving of a motor vehicle, and real property records. The court rejected the carrier's efforts to secure copies of the insured's third party personal injury litigation file as the claim before this court only involved issues surrounding the denial of first party medical benefits. Judge Conaboy felt that the carrier could gather the same information that may be relevant to the payment of medical expenses and the residency issue by a review of the medical records and by deposition of the insured. Anyone wishing to read this Opinion by Judge Conaboy in the McBride case may click this LINK. I send thanks to the writers of the excellent PENNSYLVANIA AND NEW JERSEY INSURANCE BAD FAITH CASE LAW BLOG at the Philadelphia law firm of Fineman Krekstein & Harris for publicizing this decision.